just do what you do best! Build it and Win It! Not much but anything to support a fierce member of the hillclimb family!! Can't wait to see Chicken 2 in action. I'm a broke college student but I'm a fan of the super chicken! I wan't to see this happen! So Close! This car/driver/race-support-family is nothing short of inspiring, a perfect example of what grassroots/independent motorsports are capable of. The rear end of Super Chicken 2 is coming along, but progress is slow. Hoping this will see an event or two this season at NEHA. Everybody Cluck now! Every Super Chicken needs a Super Square custom transfer box. Things are coming together on Chicken 2. Some build days are slower than others. Timeline is looking like mid 2016 NEHA season for a debut. Thanks for all of your support! My name is Paul Tingaud, and I am the Driver/Builder of the Super Chicken. I have been hillclimbing for over 20 years. 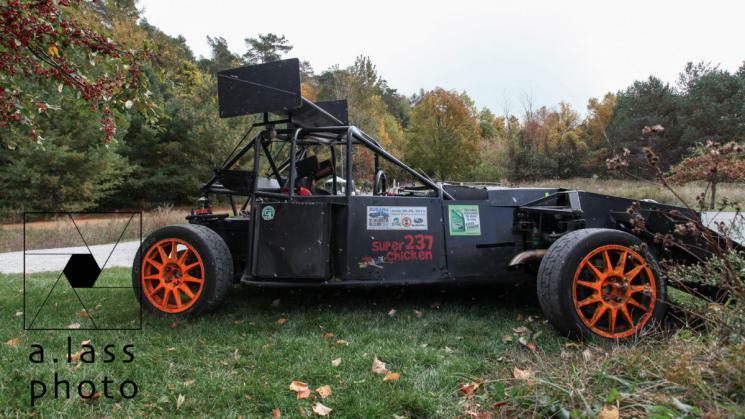 In the last 5 years, the Super Chicken has set hill records at all but two of the New England Hillclimb Series events. I was named King of the Hill in 2013 and 2015. I have competed at the Mt. Washington Climb to the Clouds four times, earning a 5th place finish in my first time running the hill in 2000. The following year, I improved to a 4th place finish. Upon the return of the Mt. Washington Climb to the Clouds in 2011, I was able to improve once again to a 3rd place podium finish behind David Higgins and Todd Cook in first and second place, respectively. In 2014, I repeated my 3rd place finish behind the factory-backed Subaru's of David Higgins and Travis Pastrana. 2017 marks the return of the Climb to the Clouds Mt. Washington Hillclimb. Currently Super Chicken 2 is being built to compete in the 2017 CTTC. In order for the best opportunity to race against the big guys, I am reaching out to help get the Super Chicken the best prepared car it can be. Specifics that I need your help to fund include tires, rear limited slip differential, fuel, turbos, and possibly a sequential transmission.